Artillery gives any war chief an awesome amount of power to strike down his enemies. It does, however, require careful handling in battle to make artillery work well with the informal tactics that many tribes use. The art of making and repairing cannons is one that tribal smiths can understand, but it is not an easy process with their tools and resources. 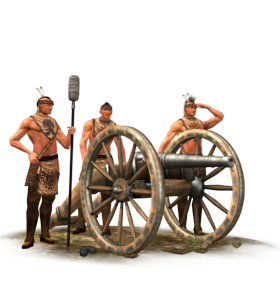 Historically, the Native Americans never developed anything approaching an artillery corps. Heavy weapons did not suit their style of fighting and would have reduced the tribes’ strategic mobility too. The Europeans were also quite careful to prevent the tribes acquiring any cannons: the military independence that this would have granted was a step too far.